Can you believe that Kathryn Bernardo has been in the showbiz industry for more than a decade now? Since then, Kath, who just turned 22 this year, played bit roles in teleseryes as a kid, starred in multiple television shows, films, and commercials, and is still making us kilig with her love team partner and real-life boyfriend Daniel Padilla. Let's take a look back at Kath's most memorable roles over the years! As a child actress, Kath played the younger versions of lead characters from shows such as It Might Be You, Vietnam Rose, Gulong Ng Palad, Agua Bendita, Pangarap na Bituin, Prinsesa ng Banyera, Endless Love, and Magkaribal. Kathryn was part of the first batch of Goin' Bulilit, a kids' comedy show on ABS-CBN which airs every Sunday. The cast is composed of child actors and comedian Dagul where the kids act out comedy sketches. Kathryn played the role of kikay little girl Maya, the love interest of Budong or Super Inggo (Makisig Morales) and the daughter of Kanor (Mark Anthony Fernandez). Budong refers to her as his "babes." Although she is sometimes masungit, Maya has an INTENSE crush on Super Inggo. In the remake of the 1992 TV series (which starred Judy Ann Santos and Gladys Reyes) Kathryn played the iconic role of Mara David. Mara lives a hard life, not knowing that she was actually switched at birth with Clara (Julia Montes). The two girls unexpectedly meet as teenagers and the truth is eventually revealed and chaos erupts between their families. 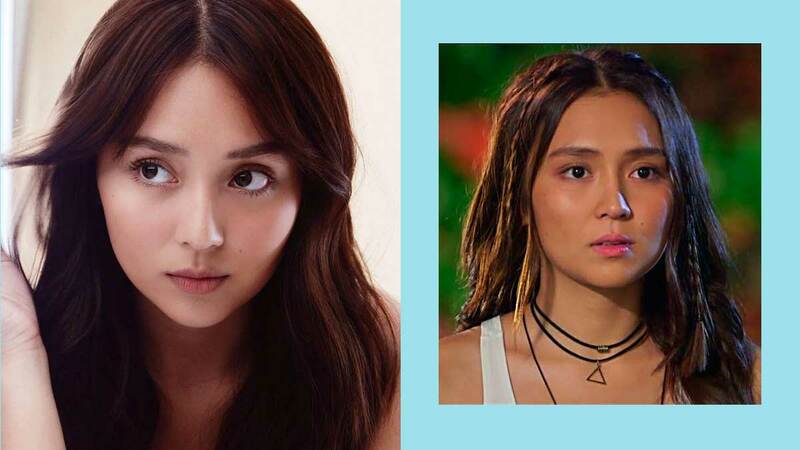 In this teen series, Kathryn was part of an ensemble cast as Mikaella "Ella" Dimalanta—a 15-year-old student from a modest private school in Zambales. She lives with a single mother who has bad taste in men and because of this, Ella distrusts guys. Until, that is, she meets and falls for a certain classmate named Patrick Rivero (Daniel). P.S. Growing Up was where Kath and DJ first worked together! For this series, Kathryn played the role of Mikay. The heir to a fictional country called Yangdon and the daughter of the king and a Filipino mother, Mikay/Princess Areeyah gets lost in the Philippines and is adopted by a kind passerby. She grows up not knowing her lineage while her father (and the whole kingdom) thinks she's dead. Guess what? For this series, Kath had not just one or two, but three leading men! There's Enrique Gil who's a member of Yangdon royalty, Khalil Ramos as her best friend since childhood, and Daniel Padilla as the new guy that she has a cat-and-dog relationship with. Kath played the role of Chichay who meets her childhood friend Joaquin (Daniel) again after 10 years. They have no idea that they used to know each other and they get off on the wrong foot. Joaquin, who suffered from a brain injury when he was younger, feels that he's somehow different from everyone else. As a result, his overprotective mom (Carmina Villarroel) hires Chicay as his nanny. In another remake of a '90s classic, Kath stars as Yna Macaspac, a poor girl who falls for Angelo Buenavista (Daniel). Unknown to them, their families are intertwined, and Angelo's mother Madam Claudia (played by Angelica Panganiban) is determined to make Yna's life miserable and destroy their relationship. The show also stars Jodi Sta. Maria as Amor Powers who seeks revenge from those who've wronged her and Ian Veneracion as Eduardo Buenavista, Angelo's father. Kath is Malia, the daughter of powerful vampire Mateo (John Lloyd Cruz) and chosen wolf Lia (Angel Locsin), who is destined to defeat and overthrow the leader of vampires called Supremo (Richard Gutierrez). Because Malia is a threat, Supremo tries to kill her whole family but she escapes and is brought to a secret base by a trustworthy werewolf. La Luna Sangre is actually a continuation of the 2008 fantasy series Lobo and its 2010 sequel, Imortal. We're all familiar with Kath's blockbuster movies with boyfriend Daniel Padilla. Kath played innocent and boyish Princess in Must Be Love, Athena in She's Dating The Gangster, wild child Jackie in Crazy Beautiful You, Mia who's looking for a fresh start in Barcelona: A Love Untold, almost-perfect girl Gab in Can't Help Falling In Love, and most recently as a med student named George in The Hows Of Us. The film follows the story of two sisters, Ana Bartolome (Kathryn) and Jessica Santiago (Julia). They were accidentally separated as kids, and after twelve long years, they've grown up, belong to two very different worlds, and their family reunion doesn't go as smoothly as expected. For the second part of the film entitled Parola, best friends Lucy (Kath) and Shane (Louise delos Reyes) are out in the province for a camping activity with other students. The story involves an old dilapidated lighthouse, adventurous teenagers, and, of course, supernatural entities/ghosts. Kath is currently working on the family drama called Three Words To Forever where she stars with Sharon Cuneta and Richard Gomez. The film will hit theaters on November 28!